Jersey Shore reality star Deena Cortese was arrested in Seaside Heights, New Jersey Sunday afternoon. 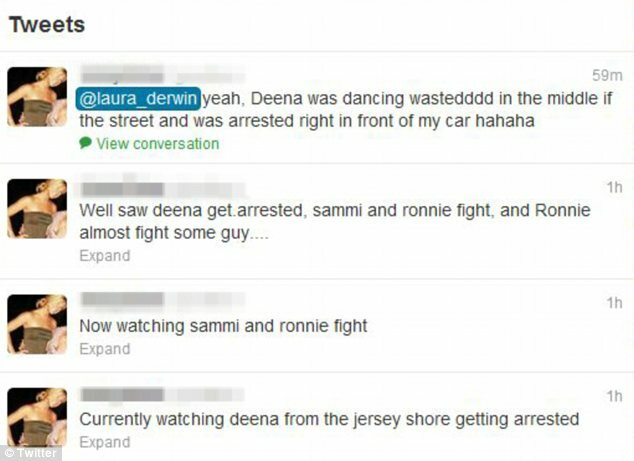 TMZ reports that Deena was booked by authorities for disorderly conduct and public intoxication. Onlookers say that the starlet was dancing in the streets in front of cops. After a while police officers became annoyed with Deena's antics and decided to handcuff her and take her to jail. This news comes on the heels of the revelation that other members of the Jersey Shore cast were involved in a "massive bar brawl" Friday. Cast members JWoww and her boyfriend Roger Matthews, Pauly D, The Situation, and Ronnie Ortiz-Magro were caught up in the violent fracas at popular Seaside Heights venue Bamboo Bar. Cast member Vinny Guadagnino was also present when the fight broke, however he remained neutral. Pregnant star Nicole "Snooki" Polizzi was not present at the time of the struggle. The reality TV stars have started filming for the sixth season of the hit MTV show.